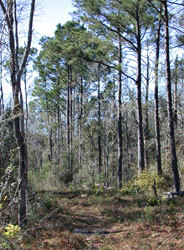 The Carolyn Raizes Davis Bird Sanctuary is a 63-acre bottomland forest in Brazoria County, 7 miles southeast of Alvin. The sanctuary follows the meanders of Chocolate Bayou. The sanctuary came to Houston Audubon in two donations from Houston businessman Scott Davis, with the request that it be maintained as a bird sanctuary in honor of his wife Carolyn Raizes Davis. The first half of the donation was made in 1999, and the second half was donated two years later. A conservation easement was given by Houston Audubon to the U.S. Fish & Wildlife Service on the sanctuary shortly thereafter, and USFWS partners with HAS in management of the sanctuary. It is open to the public. Please note that there is currently no trail system. Houston Audubon's partnership with Texas Mid-Coast National Wildlife Refuge Complex continues to be extremely beneficial for wildlife. In 2007, Project Leader Jennifer Sanchez and Refuge Manager Floyd Truetken provided the leadership for Lee Gaston, Willy Zgarba, Don Jacobson, and Gene Lacey to complete the fencing and sign installation project at the Carolyn Raizes Davis Bird Sanctuary. The project was funded by prize money from the Great Texas Birding Classic. The fencing provides protection from ATV intrusion in the sanctuary, furthering Houston Audubon's goal of protecting essential bird habitat in the Columbia Bottomlands.